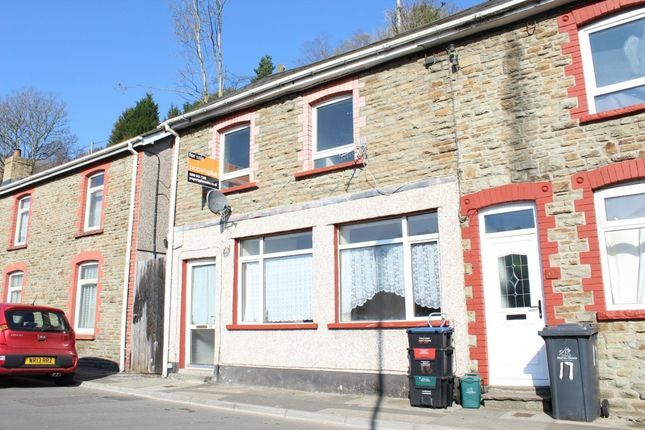 This is a three double bedroom end terraced traditional stone built property situated in a convenient location offering easy access to the main town centre itself together with easy access to the railway station nearby and bus connections. It offers easy access to Newport, Tredegar and to the M4 corridor. Situated in a small village with unspoilt views and walks over the surrounding countryside, the property would ideally suit perhaps property investor or first time buyer, however offers excellent accommodation with small yard to rear. Briefly comprising entrance Porch, open plan Lounge/Kitchen/Diner, shower room and WC, first floor Landing, three generous size Bedrooms, family Bathroom and garden to rear. Entrance via UPVC double glaze door allowing access to entrance Porch. With plastered emulsion decor, wall mounted electric and gas service meters, ceramic tile flooring, wood panel ceiling. Clear glazed panel door to rear allowing access to open plan Lounge/Kitchen/Diner. With two UPVC double glaze window to front, plastered emulsion decor, with one feature papered wall papered, wood panel ceiling with quality laminate flooring, two central heating radiators, ample electric power points. Open plan stairs to first floor elevation. With plastered emulsion decor, wood panel ceiling with electric strip light fitting. UPVC double glaze window and door to rear allowing access to rear garden. Laminate flooring and radiator. Full range of Light beech fitted Kitchen units comprising of ample wall mounted units, base units, ample work surfaces with coordinate splash back tiling. Single sink and draining unit with mixer tap. Electric cooker power point and extractor cane fitted above. Plumbing for automatic washing machine. Ample space for further appliances. White panel door allowing access to Shower room and WC. With pattern glaze UPVC double glazed window to side. Fully ceramic tiles floor to ceiling, with plastered emulsion decor to ceiling. Air fan and ceramic tile flooring, radiator, marble effect panelling to two walls, ceramic tiling to remaining. Low level WC and walk-in shower cubicle with electric shower. With UPVC double glaze window to side, plastered emulsion decor and wood panel ceiling, spindle balustrade and modern fitted carpet, generous access to loft. Wall mounted combination boiler supplying both domestic hot water and gas central heating. Electric power points and doors allowing access to Bedroom one, two, three and family Bathroom. With UPVC double glaze window to front, papered decor, wood panel ceiling, fitted carpet, radiator and ample electric power points. With UPVC double glaze window to rear, papered decor, wood panel ceiling, fitted carpet, radiator and ample electric power points. With UPVC double glaze window to rear, marble panelling to one wall, ceramic tiling to further two walls and half way to remaining. Wood panel ceiling, exploit layer fan and cushion floor covering. Bathroom suite to include panel bath, low level WC and wash hand basin. A small enclosed yard with no rear access.